The faculty and staff of MSUM are extremely important to making the school and students successful. Through their jobs, they help the university provide each student with what they came to college to achieve. Some faculty and staff take this dedication to the next level by providing not only their services, but also their monetary support. 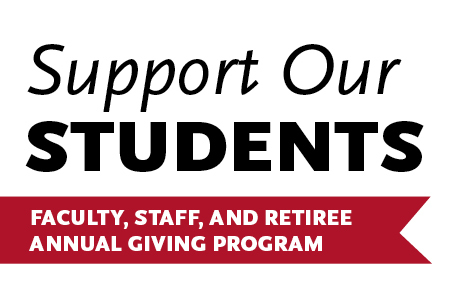 Formerly known as the Campus Campaign, Support Our Students is a program aimed at MSUM faculty and staff, including retired members. Through this program, they are given the opportunity to donate a part of their paycheck each pay period or give a timed donation through credit or debit card. Anna Miller, director of annual giving for the MSUM Alumni Foundation said there was 29 percent participation from possible donors last year, with the average donation per pay period being $5. Even though it doesn’t seem like much, that small donation adds up to about $130 annually. Just from this campaign alone, Miller said the foundation raised $226,000 in 2012. This is good news for students, considering these donations go directly to them. While donors have the ability to choose where they would like their money to go, most decide to give to scholarships. The primary need scholarships are the most popular, giving money to students who would otherwise be unable to afford college tuition. Other options for donation include giving department specific discretionary funds. Miller said this is also a common choice because “professors see the need in their own departments.” These donations often supply departments with new equipment or help fund certain student projects. The Alumni Foundation has hosted the program for over 10 years. Almost 10,000 students have been the recipients of scholarships over the last 15 years, thanks to donations taken in by the foundation. Last year it provided more than 500 students with scholarships. The Support Our Students program has undergone some changes recently. Besides the name, the timing of the program has been moved from starting in the spring to starting right away in the fall. Miller said this change was put in place to “make the program a priority” and get the available donors thinking about giving right away in the school year. Moving the program forward and aligning it with the academic year seems to have been a good move, as both participation and the amount of money taken in has increased. Another major change has been the switch to payroll deductions as the main way of receiving donations. There has also been an addition of available places for faculty and staff to allocate their money. Though the Support Our Students program is only open to past and present faculty and staff, there are other campaigns throughout the year for others wishing to donate. “The campaign is the time when we are actively soliciting gifts, but people make gifts throughout the year,” Miller said. At the beginning of each school year, the faculty and staff are sent a packet with a brochure about Support Our Students, as well as a letter outlining their past donation history. Along with this reminder to continue or start donating, the program is advertised in the “Dragon Digest.” Direct emails are sent to the faculty and staff as well. A spring recognition banquet is held to thank those who participated over the year in any giving program through the Alumni Foundation, not just Support Our Students. Anyone with questions or wanting to donate should go to the program’s website.